Synthetic motor oil is specifically formulated for the purpose of lubricating internal combustion engines. In comparison, conventional motor oils are refined from natural crude oil, which contains many components that aren’t useful for this purpose. Both types of motor oil are categorized according to their physical properties as an engine lubricant. The decision to use synthetic or conventional oil in a work truck generally comes down to a comparison between synthetic oil’s greater durability and the lower cost of conventional oil. Synthetic oil is manufactured from a variety of both organic and inorganic base chemicals. These chemicals are typically components of petroleum, but other sources may also provide the raw materials needed to make synthetic oil. Although highly refined from crude oil, traditional motor oil nevertheless contains ingredients that can be harmful to an engine. As result, synthetic oil generally has more predictable properties for engine lubrication, especially at high temperatures. The American Petroleum Institute (API) rates motor oils according to a range of physical and chemical properties. Synthetic oil is typically categorized as API Group IV or API Group V, and semi-synthetic oils are also used as motor oil. API Group IV consists of polyalphaolefins, commonly known as PAOs. These compounds are entirely synthetic and are made by polymerizing alpha-olefins. An olefin is chemically classified as an alkene, which is an unsaturated hydrocarbon with at least one carbon–carbon double bond. In the case of an alpha-olefin, the double bond is between the first (alpha) and second (beta) carbon atoms in the hydrocarbon chain. PAOs are typically used as the base stock of a synthetic oil. API Group V consists of esters, which are derived from acids. At least one of the hydroxyl groups (oxygen-hydrogen) in the acid is replaced by an alkoxy (oxygen) group to form an ester, which generally involves condensing the acid with alcohol. This class of engine oil is also completely synthetic. Esters provide excellent lubrication and may be used as a base stock for a motor oil or an additive. Semi-synthetic oils, also known as synthetic blends, contain a base stock that’s less than 30 percent synthetic oil, although they may also contain ester additives to further improve performance. The ratio of the base stock to the additives is routinely used to determine the customs taxes when importing semi-synthetic oil. Century 2100 was the first brand of semi-synthetic motor oil ever manufactured, which was first produced in 1966 by Motul. The primary purpose of semi-synthetic oil is to provide many of the benefits of synthetic oil at a lower cost. A work truck that uses conventional oil typically requires an oil change about every 3,000 miles or three 3 months, whichever comes first. Synthetic oil lasts a little longer than this since it’s more stable and therefore doesn’t evaporate as quickly. Engines that use synthetic oil may only require an oil change every 4,000 miles or four months under heavy use. Some types of synthetic oil may not need to be changed for 20,000 miles under ideal conditions. However, this schedule assumes that the truck is only driven short distances, which won’t heat the oil sufficiently to make it evaporate. Synthetic oil usually costs about twice as much as conventional oil. 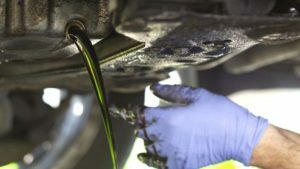 The best conditions for using synthetic oils occur when the engine runs continuously for long period of time at high temperatures, which causes conventional oil to evaporate quickly. A full-time work truck can use six gallons of conventional oil per year under these conditions, whereas it may only require two gallons of synthetic oil. Another factor to consider is the possibility of recycling used motor oil. However, this process requires a lengthy process that may not be more economical than buying new motor oil. Synthetic oil is generally a better lubricant, since conventional oil contains contaminants that reduce engine life. However, the higher cost of synthetic oil means that they are best used in cases where conventional oil would be quickly consumed.